I have previously written about primitive weapons and how the prepper or survivor might make use of them. However, in a broad overview piece like that, it is difficult to do more than introduce certain concepts, and leave it up to the self reliant reader to build from there. However, there is a lot more that can be said about primitive weapons, their uses and how to make them, and that is what I am attempting here. Naturally this cannot be an exhaustive guide, but it should set you down the straight and narrow, and leave you better informed. For the purpose of this article, primitive weapons are defined as pre-gunpowder weapons that can be made without the tools of industrialization. Now that covers a lot of ground, and could be broken up into a lot of different categories. For instance, we could focus only weapons made without metal, but I think there are a lot of good reasons to draw the line at simply pre-gunpowder arms. stone scrapers and arrowheads. Courtesy National Archives. For one thing, we all are creatures of a modern, industrialized society. For another, our knowledge of history, tools, and materials doesn’t vanish just because we want to make or understand primitive weapons. In fact, unless you are trying to master primitive weapon making as a hobby or experimental archeology, then there is little reason to say, learn flint knapping. However, understanding how primitive weapons were made is an important first step to making your own, using a mix of modern and primitive materials. Our ancestors made do with a mix of stone, bone, wood, natural adhesives, and natural fibers – either plant or animal based to make their survival weapons. Later on, they learned to work metal, and incorporate that into their weapons. The survivor is under no restriction to use any primitive materials in creating their weapons, but rather simply should be able to know how to create those weapons with materials close at hand. Often, when many of us think of primitive weapons for survival, they might think of Native American weapons. After all, they were surviving and thriving in North America long before Europeans showed up, and managed to do quite nicely for themselves with traditional tools and methods well into the 19th century and later in some cases. This simply demonstrates that while a steel knife and repeating rifle are great things to have, if you don’t have them, then it is possible to make do without. The only question is are YOU capable of doing so? Every tribe and culture had their own weapons. There was plenty of cultural exchange going on, so that tools, materials and methods used by one tribe could spread across entire geographic regions. While generations of western movies and sensationalist literature have conditioned us to think of bows and arrows and tomahawks as the stereotypical native weapons, their weapons varied widely, and often were simply repurposed hunting arms. Spears, bows, clubs, knives, and tomahawks all were used as weapons or hunting tools, and remain as lethal today as they were centuries prior. 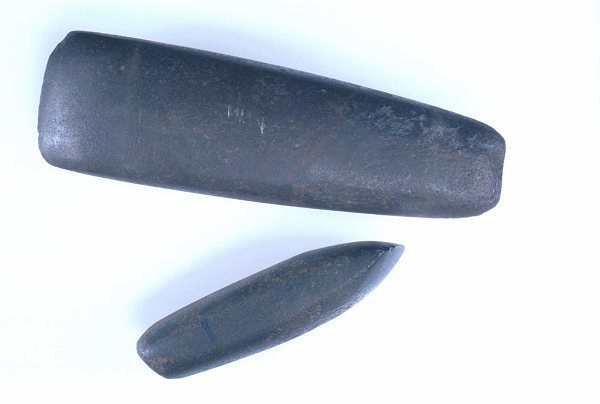 Prior to the arrival of European traders and settlers, native weapons had to be made with the same kind of primitive materials as the weapons themselves. Think about that for a minute. Are you capable of taking a rock, and using it to make sharper rocks, and then use another rock to cut and shape a branch so that you can attach your first sharp rock to it? Can you make the binding material out of sinew or plant fibers, or rawhide to attach the sharp rock to the shaped stick? Can you make any glues or adhesives that make the process easier? The answer is “probably not.” But, there is no shame in that. Every primitive tool user in the world started to quickly upgrade their methods and designs as they came into contact with more advanced technology. Native Americans hunting salmon with traditional spears. Courtesy USFWS licensed under a Creative Commons license. This lead to hybrid designs of weapons. Projectile weapons gained metal points when they could be had. Tomahawks and hand axes gained iron or steel heads. Knives became metal instead of stone. Bottle glass could be reworked in place of stone or bone. Guns replaced bows – as long as the ammunition lasted. And then sometimes they became clubs. The modern prepper seeking to add to their survival toolkit, knowledge base, or who may be forced to use primitive weapons should make careful note of how such weapons change when their users come into contact with more modern technology. It is exactly that sort of hybrid approach that will best suit the prepper, and allow them to make optimal use of available materials and skillsets. Let’s look closer. What role does the primitive weapon play in the 21st century prepper’s world? Should we care? Or is learning how to attach a sharp bit of metal to a stick simply a quaint exercise in romantic fantasy that scratches a primal itch, but accomplishes very little of meaning? Most every survival guide is full of instructions of various usefulness on how to make or use primitive tools and weapons in a survival situation. I’ve said it before, and I’ll say it again. Primitive weapons are without value if you do not know how to make or use them now. Without the skill to make and use the primitive weapons you think you’ll someday need, you might as well just roll over and wait for the government to save you. You need to start asking yourself now what kind of primitive weapons you’d like to be able to make and use, so that you can master their art, Some primitive weapons have become standard tools in the prepper’s survival kit. Knives and tomahawks are pretty common, and few think of them as primitive weapons, but that is exactly what they are. The fighting axe and tomahawk are closely related, and often share similar skill sets. The well equipped prepper should have at least one tomahawk or hand axe to use as both a tool, and a weapon. Bows and crossbows might also be considered primitive, but the modern version of each would be utterly alien, yet very familiar to their earlier users. Cool story bro. Maybe you can. I hope you can. I hope all of us could do that. I’m not going to say I could. I am going to say that if I had to make a primitive weapon using found industrial and natural artifacts, I could make something. And sometimes something is all you need. But the better something you make, and the better you understand how to use that something, and what limitations it has, the better off you and your prepper group are. Primitive weapons and their use force a mindset of conservation. Conservation of human energy. Conservation of materials. Conservation of time. Conservation of effort. A gun is easy to use, and requires little real effort by the prepper. A spear is hard to make, and requires a lot of effort to use properly. You might casually write off a few fired rounds. It is hard to casually write off trying to spear an animal. Or person. You have to change your entire way of thinking when picking up a primitive weapon. Not only do you have to expend more energy in using it, but you are also a lot more intimately involved with the process of using it. Weapons kill. Guns kill at a distance. Primitive weapons put you up close and personal in a self defense situation or hunting situation. Guns can make clean kills. Primitive weapons rarely make clean kills. Ask yourself if you can handle the mental stress or even trauma associated with using a primitive weapon. Until you can learn that, you shouldn’t go any further. But you need to also learn how to make a lot of primitive weapons. I’m going to be generous and assume you’ve got a modern knife and hand axe. Those are easy to keep on your person at nearly all times (so is a handgun!) and if you happen to hit one of those rare situations where you have to resort to primitive weapons, then you can start making one. Cordage making. You can make rope and bow strings from plant fiber, animal sinew or hide. There are a lot of different ways. Start studying them now, and what is most applicable to where you live. Wood working. If you are going to make primitive weapons, you need to know how to shape and work wood to suit your purpose. You shape wood for a bow differently than how you shape wood for a spear or axe handle. Learn the differences. Be realistic. Simple is best. A sharp thorn on a stick might be all you need to kill small game, and a club is sometimes just as good for deterring an attacker in hand to hand combat as a spear that requires more work to make. Learn to mix and match technologies. No sane prepper will turn down a piece of modern material to make a primitive weapon with. There is no glory or honor in primitive weapons and primitive materials outside fiction and organized competition. Take whatever industrial shortcuts you have to get the job done. Become acquainted with the kinds of primitive weapons you’d like to make. Build a few. Practice with them. Try to break them. Break them. Build better ones. Rinse and repeat. Only you can decide which primitive weapons you’d like to learn how to make and use. And only you can decide which of those will be most compatible with your prepper lifestyle. Now is a great time to visit local museums and see what the Native Americans in your region used for weapons. That will give you valuable clues as to work best in your area. If you are seeking to build primitive weapons for self defense, you need to start practicing with their construction and use right away. It is very unlikely you’d be using them against somebody equally armed, so you need to figure out how to adapt your tactics and techniques to people armed with firearms, and possibly equipped with body armor. Take a walk. Look around you. What weapon can you build from materials you found on your walk? What weapons could you build by modifying those things with a few different tools? Local living history and reenactment groups may be valuable sources of knowledge for using or making primitive weapons. Most of all, become intimately acquainted with the peoples who used primitive weapons and how they used them. If you are not interested in focusing on a particular culture, you might choose to look at the tools of different historical eras. The Stone Age lasted about 30,000 years and covered three distinct eras which ended at the dawn of the Bronze Age. Following the Bronze Age, we encounter Iron Age weapons, and increasing complexity of arms until the rise of firearms and industrialization. While I would argue learning primitive weapons should be low on the skill base of the average prepper, it should be high on the knowledge list. By learning how our ancient ancestors fought, what weapons they used, and how they made them, we can learn not only how to survive better, but how to improvise and adapt materials and weapons in an emergency. Our modern tools and weapons can fail. We can be left away from all the advantages and luxuries of modern civilization. But the person who can make a stone speartip, or who can pick up garbage and make a weapon has an edge that your average person cowering in their home waiting for somebody else to save them can never have.